The area between Andreasgasse and Kirchengasse is a pedestrian zone. No cars are allowed in this area. 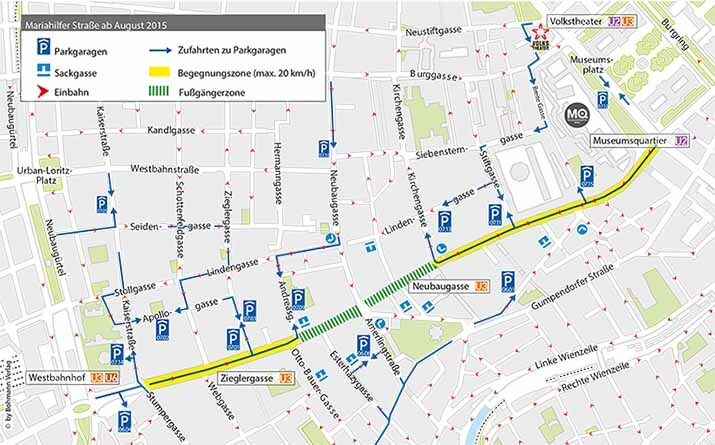 The areas between Getreidemarkt and Kirchengasse as well as between the Kaiserstraße and Andreasgasse are encounter zones. Cars are allowed in these areas along the Mariahilfer Straße (note the one way regulations!). Car drivers should be considerate of pedestrians, the speed is limited to 20 km/h. Since some dead ends were established as part of the traffic regulations, please plan your route in advance! Parking is available in the parking garages.